Early on I made this mistake with other SaaS products. I had never built a business on recurring revenue before, so coming up with a good pricing table was the same as pulling numbers out of thin air. After coming up with what, I thought, was a great set of plans, I decided I’d shoot for the proverbial stars and throw on an “unlimited” plan for a whopping $99. Ha! When you’re creating pricing plans, you should be pricing based on value. You need to find a balance of where what they’re paying is comparable to the value you’re providing, and the more value you provide, the more money you should make. A lot of entrepreneurs cringe at the thought of “enterprise sales.” I know for me it conjured up images of used car sales men. But the reality is that it’s nothing like that unless you want it to be. 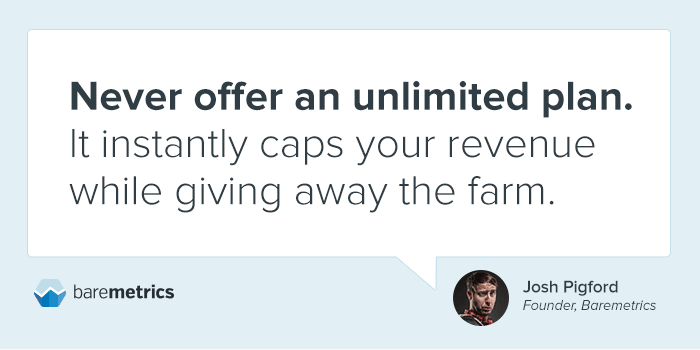 When you’re offering a product people are itching to use and happy to pay for, there’s no reason you shouldn’t charge more for it, and the sky is mostly the limit. Throwing a simple “contact us if you need a different plans” link could literally mean thousands in additional monthly revenue than you otherwise would have given away for hundreds. Nobody wins then. For Baremetrics, nearly $2000 in recurring revenue comes from our Enterprise plans, and those “Enterprise customers” are some of the greatest customers we have. They’re happily getting a lot of value and we’re able to serve them better. Everybody wins.